butcher your own meat, poison, and razor clams: psychopathy or just another episode of food for thought? I might say both. It’s Ryan and me again hosting another dark and dangerous episode of food radio programming for maniacs, Food for Thought on KLCC, today at noon (PST) on 89.7FM in Eugene, or its sister stations all across Oregon, or live on the web. Updated: Listen to the show’s archive here. We’ll be chatting with Portland Meat Collective‘s Camas Davis, former food writer and butcher extraordinaire. Isn’t she absolutely fiercely beautiful? 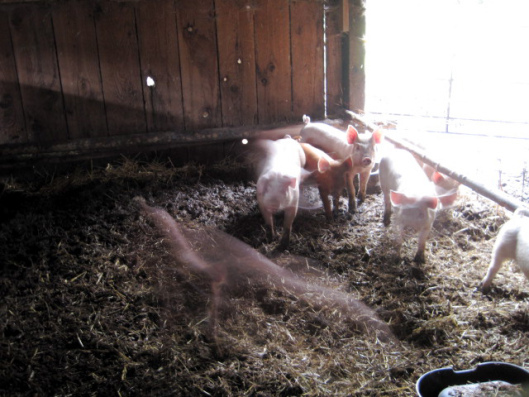 The PMC teaches people how to break down their own meat, an important element of understanding how the food system works and how we can relocalize and improve meat processing. She’s raising funds for seeding meat collectives across America in a Kickstarter campaign, and will be discussing a forthcoming class or two planned for Eugene where YOU can learn the skills and take home pounds of premium meat. You can watch a video of Davis on her Kickstarter page, listen to her on This American Life, or read the article that made her national news in the New York Times Magazine. Hello! Long time no see. It’s planning season in academia, and I’ve been scrambling to pull together grants and reports and abstracts and introductions and applications. Like so many young(ish) scholars working in adjunct positions, I’ve also been struggling with job instability and will be moving to a joint position teaching in English and Comparative Literature at the university in the fall. Although I’m excited to work with colleagues I know and respect already (don’t forget Eugene is a small town, so this is like moving down the street), it will shift priorities for me as the new classes and structure will take up more time. Some additional family financial pressures mean I will need to start prioritizing stability and writing much more, both for academic journals and professional food publications to make ends meet. Having to move is a very real possibility. Unfortunately, this will mean fewer events and volunteer projects for the community starting next year, and I’m deeply sorry about this. It’s important to give back, and the pleasures of the volunteer work I do, including the radio show, this blog, the preservation classes, the events I host at the UO through my research group, the promotion of others’ work, and volunteering at festivals and reporting on my travels and such make life worth living in Eugene. Don’t worry, I still have a few things planned for next year that are pretty fabulous. But I need to “lean out,” as they say. So the prospect of eating from the garden is suddenly even more appealing. And it’s culling time, so here are some ideas. We’ve missed out on eating grape hyacinth bulbs for the season, but you might try the bulbs (tubers, really) and buds of the pretty orange day lily. Wildcrafter Hank Shaw provides recipes, and urges you not to confuse this common plant with other lilies. Fresh oregano salad, substituting oregano for fresh parsley in any tabbouli recipe, supposedly helps young people study in the Middle East. And who doesn’t need to sharpen up the memory? With the tender spring leaves tempered by spring onions and a lemon and olive oil dressing, you won’t be overwhelmed by the dark, musky flavor and woody stems. Common snails. Yes, escargot. I felt my gorge rise when I realized in France our garden pests — yes, the exact same variety — were one of the species used for escargot. But Molly Watson has published a piece in Edible San Francisco that lays out how to prepare and cook them in a rather appetizing way. And what with the foraging all around town making its way into local bistros…new business, anyone? Any basket-weavers who are pruning? Consider a traditional grilled fish basket made of Mediterranean bay branches (above image). 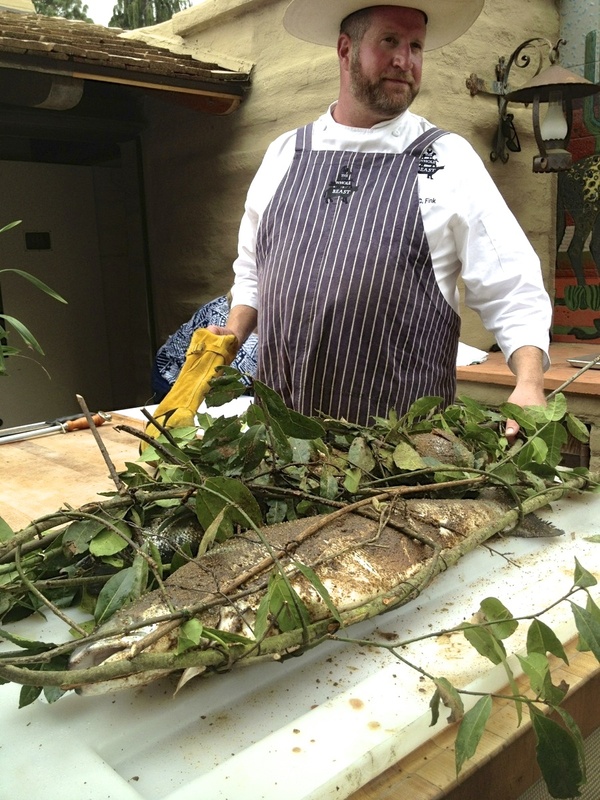 We lunched on delicious salmon prepared this way on our tour of Sunset magazine a few weeks back as part of the International Association of Culinary Professionals conference. You might be able to do something similar with rosemary branches, if that’s your unruly hedge issue. 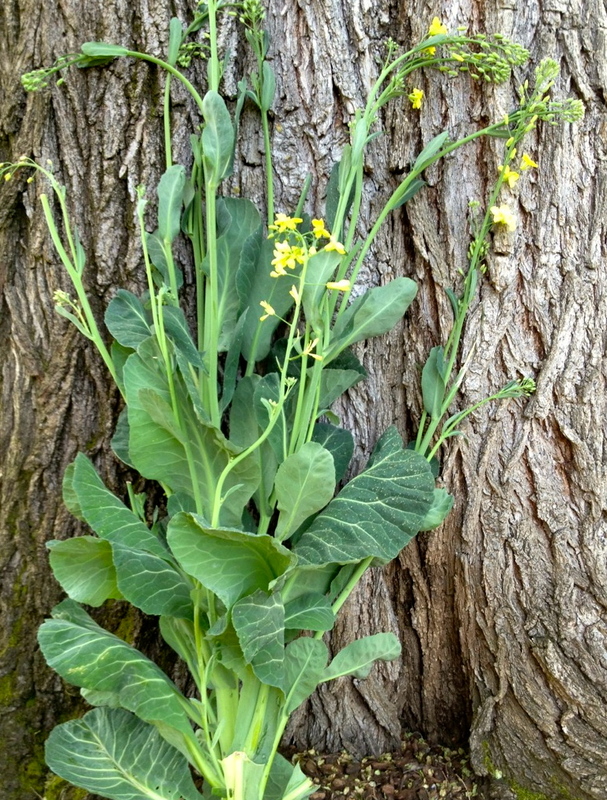 Dandelion greens can be wilted and used as a deeply flavorful green in a stirfry or potato curry, or try my fellow Oregon blogger Dr. Fugawe’s adaptation of Duguid’s Spiced Burmese New Potatoes with dandelion greens and shallot oil. But where it’s really at is RAAB. These are the tops of cruciferous vegetables that sweetly greenly provided iron-rich leaves all winter long, now bolting in the lovely sun. The market gives us a bunch of them, all tasting basically the same once cooked, but some sharper, some darker when raw. Try brussels sprouts raab or collards raab, my favorite (pictured first against tree — a very timely delivery by my beloved neighbor), or the lovely purple cabbage raab. Pasta. Try it chopped and sauteed in olive oil that has been warmed up with a little chopped garlic or culled green garlic from the garden, lemon zest, and red pepper flakes (add a little anchovy if you’re adventurous and/or wise). Throw the cooked raab into a bowl of fresh pasta, something chunky like rotini, and grate fresh parmesano all over it. You might also sample it steamed or fried with a little oyster sauce, just like the gai lan you see in dim sum houses. Or little green potstickers, anyone? Finely minced raab works especially well with ground pork as a filling. 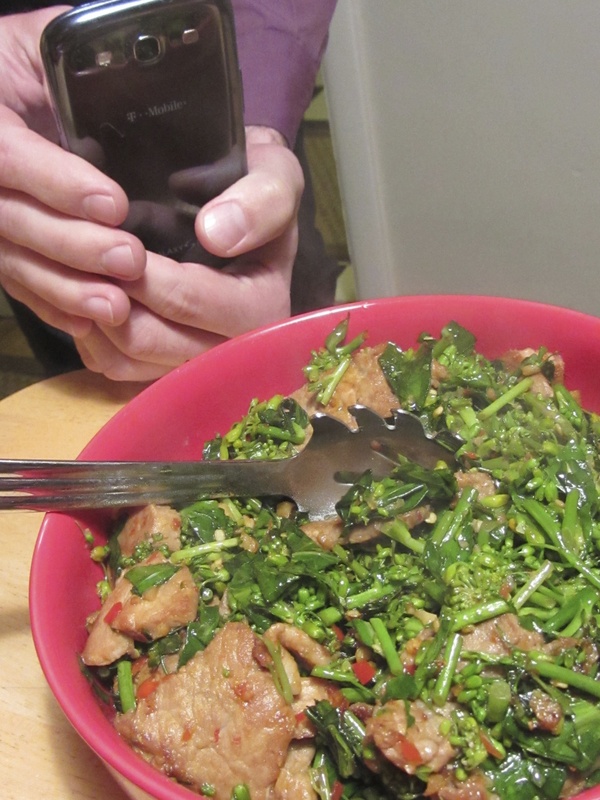 But best of all is this recipe for stir-fried chopped raab with pork and fermented red chili (above, photographed by the paparazzi). It’s an adaptation of Fuchsia Dunlop’s Bo Bo Cai Xin, or Stir-fried Chopped Choy Sum, from her cookbook, Every Grain of Rice: Simple Chinese Home Cooking, that just came out in an American edition. It’s a wonderful cookbook, with a big chapter on leafy greens that I’ve already explored extensively. My palate is a bit duller than Dunlop’s so I usually use more spice and salt than she does. You might decide on your own. But either way, definitely use the pork if you’re a meat eater. Although we sliced it thickly because of gluttony for Laughing Stock Farm pork and its delicious fat, I’d recommend mincing finely next time. Another difference is that with raab, you don’t need to blanch ahead of time. It’s much thinner and more tender than choy sum. I also substituted my own fermented red ‘Facing Heaven’ chilis for plain red jalapenos, so the recipe reflects that. Serves 2 with rice and Chinese pickles, but make several dishes and turn it into a party. 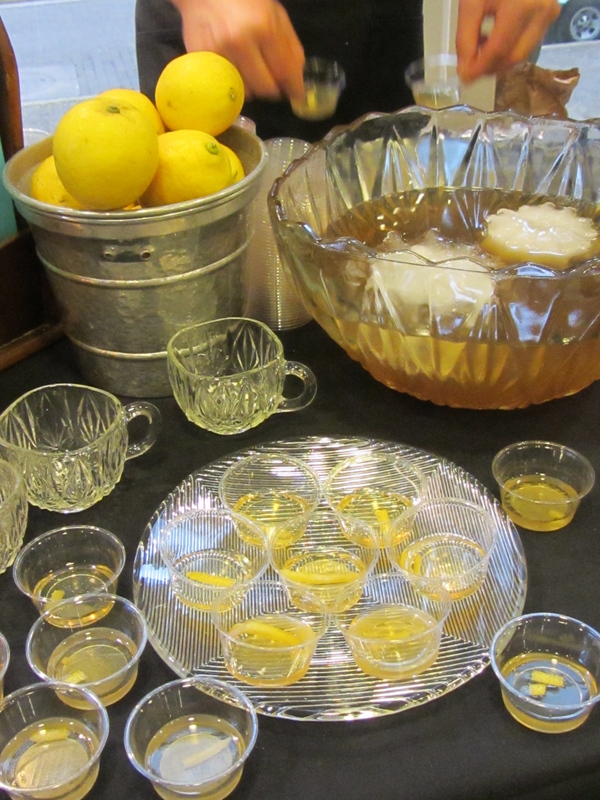 Do all your chopping and measuring ahead of time, and set aside each ingredient in little bowls. Heat wok to sizzling, then add a tablespoon of the peanut oil to heat, then quickly add the chopped raab and cook until bright green and still crunchy, just two minutes or so, then stir in red chiles. Set aside in a serving dish. Add rest of peanut oil, then add chopped or ground pork and a little salt. As the pork loses its pink but is not yet completely cooked, add ginger and garlic. When everything is nicely browned, add back the raab, stir to blend flavors and cook for a couple minutes more, then remove from heat, stir in sesame and chili oil, then serve with rice. 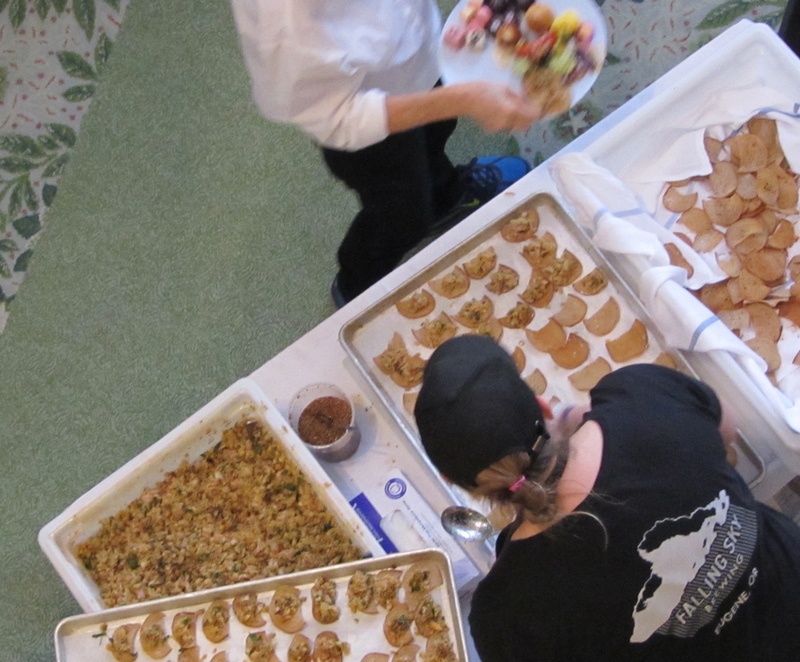 One of my favorite Eugene food events, Chefs’ Night Out, is a fundraiser for Food for Lane County, allowing local restaurants and culinary programs to experiment with cocktail nibbles for the thronging hordes. 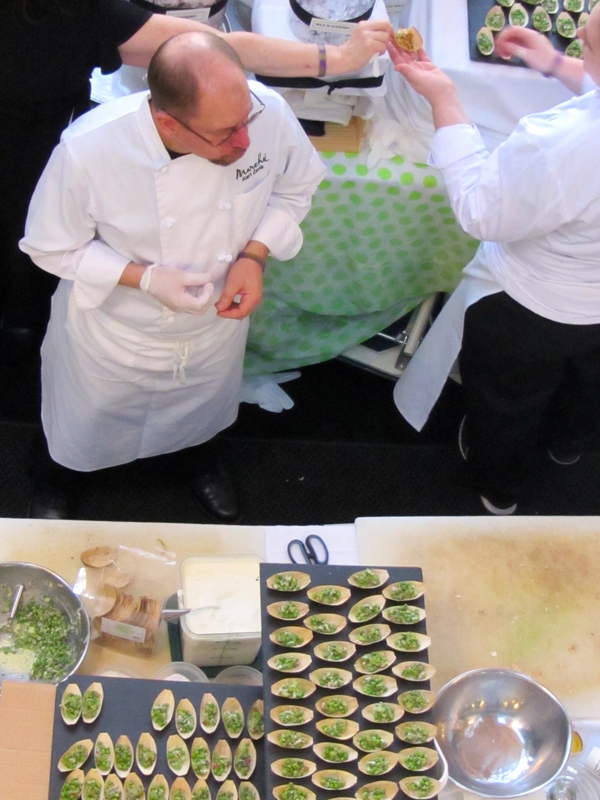 What I really like to see, of course, is the chefs and service industry workers doing what they do best. 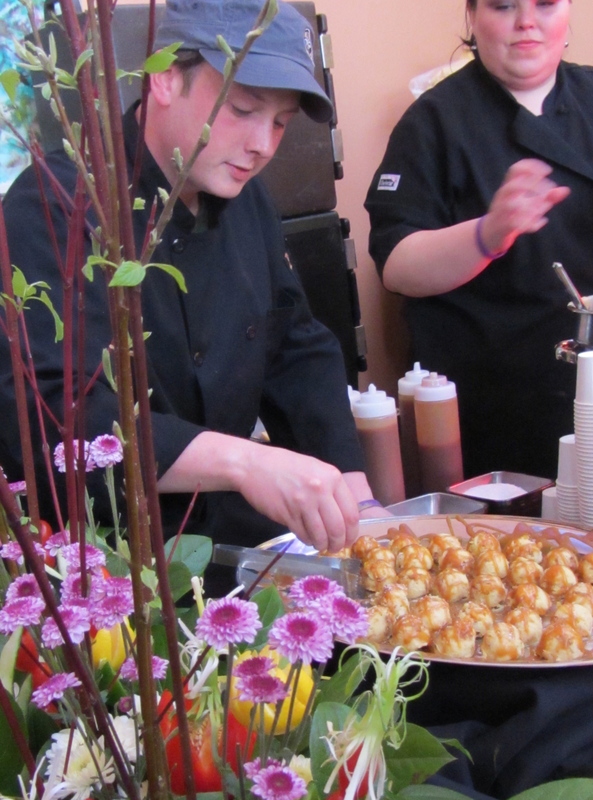 This event, like the Bite of Eugene festival that produces the Iron Chef Eugene competition in the summer, seems to be a pleasure for the industry as much as it is for the guests. It made me happy just to watch the workers interact with an appreciative public and do their thing. Also successful this year? The giant carrot balloons welcoming vegetarians in the midst of all the tri-tip nuggets, and the new secret wood-lined lounge with a jazz trio and a couple of King Estate standards. I felt almost hip looking at the tweets broadcasted on the wall on a giant screen, so I drank a pomeberry-pink cosmo against my better judgment. Congratulations to the winners of this year’s competition: Best Overall Bite – Marché Restaurant. Best Presentation/Hospitality – Sweet Life. 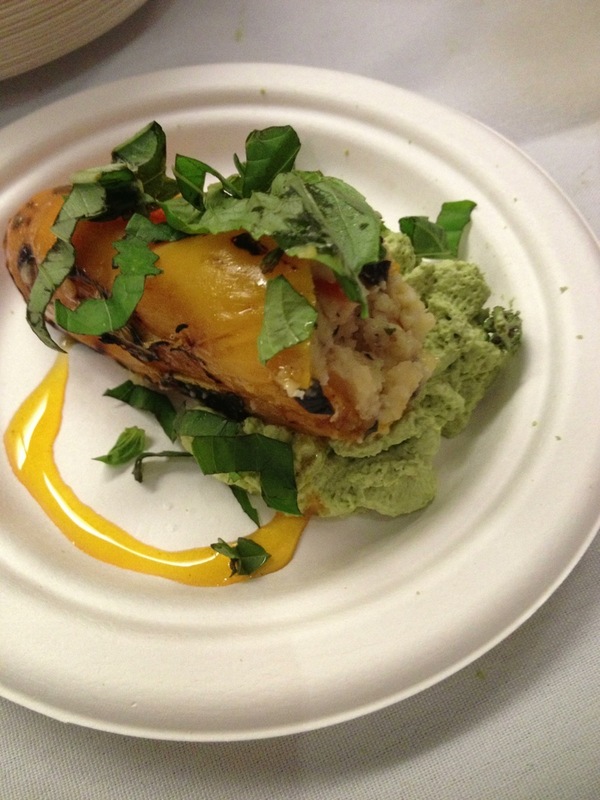 Best Savory Bite – King Estate Winery. Best Vegetarian Bite – Govinda’s. Best Sweet Bite – Red Wagon Creamery. We don’t know exactly what won, though. On the Food for Lane County Facebook page, they indicated to me that “The judges don’t always indicate which specific dish they are voting for, however we did note on ballots that these dishes caught judge’s eyes: Marche’s Spring Pea and Asparagus Salad; King Estate Winery’s Charcuterie (Saucisson Sec, Smoked Duck Breast Speck, Pork and Black Truffle Paté); and Red Wagon Creamery’s Chocolate Meringue Cookies with Toasted Sesame Ice Cream and Whiskey Caramel [below]. We will try to encourage judges to be more specific in their choices next year!” That’s a terrific idea. I was kind of surprised that all the deserving winners were located on the main floor atrium; did the judges go upstairs? 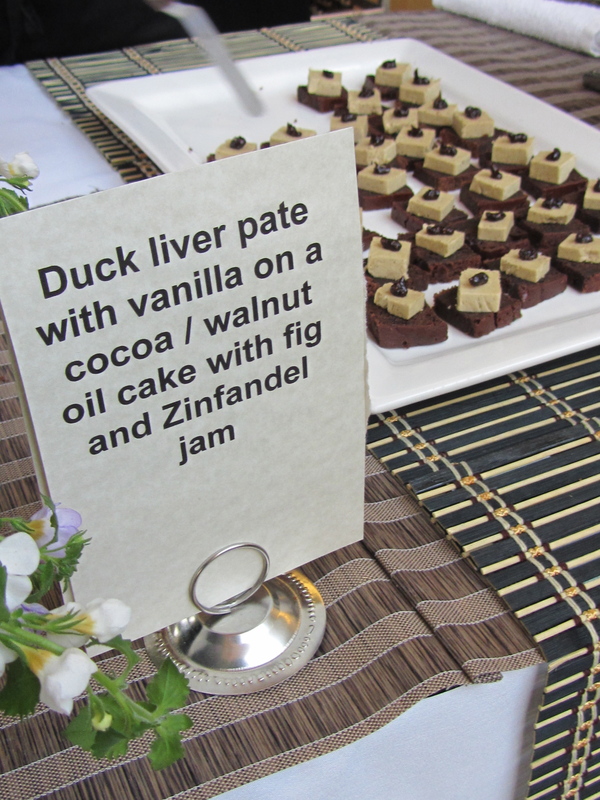 If they did, they most likely enjoyed my Best Overall Bite, Koho Bistro’s duck liver paté on a slightly sweet walnut cocoa flat cake with fig and Zinfandel jam. The flavors matched perfectly. And not too shabby was the other dish at Koho (which the judges did see since they gave it an honorable mention), the candy-cap mushroom crème brûlée on a pepper sablé with smoked caramel glass (below). This is the second year in a row that I’ve found Koho’s bites the best, but the quality just hasn’t been acknowledged. 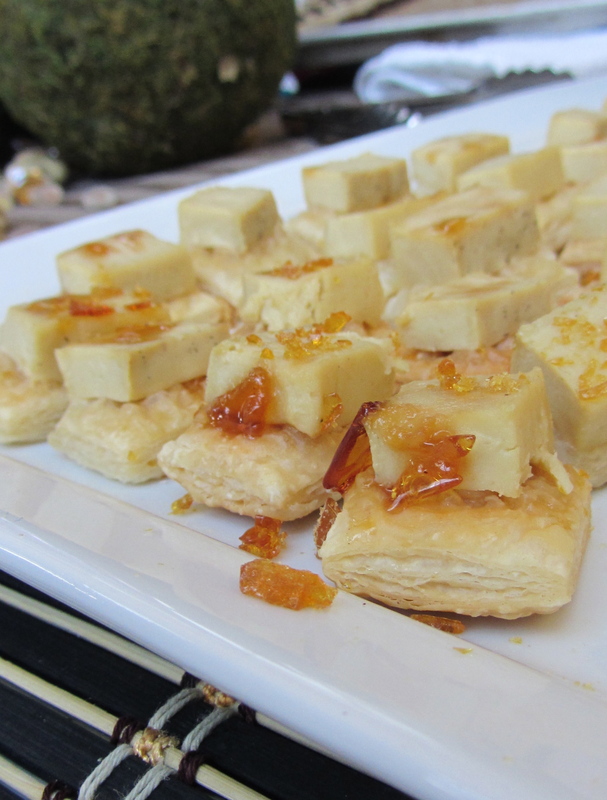 (Last year, it was the candied kumquat and farmer cheese on black pepper shortbread canapés.) What is in store for next year? 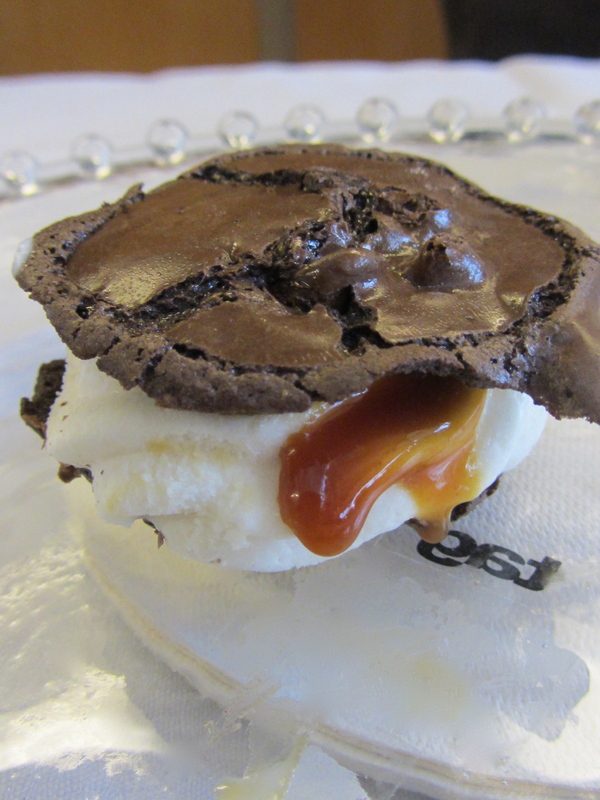 The smoked caramel glass was particularly effective with the puddingy pillowy bite. It was like the princess and the pea or every rose has its thorn or something like that. Other unexpectedly delicious treats were the ricotta-mirepoix-mushroom stuffed pepper with a very fresh and wild basil mousse and chile oil from Ambrosia; a perfectly classic endive, celery and walnut salad with a lemon-tarragon mayo on a homemade potato chip from the catering outfit Our Daily Bread (better than the only other veg bites, award-winning Marché’s peas and Govinda’s stews, I thought); a simple pork confit taco from the new food cart Gastronomad, which was down in the Ninkasi tent; and the now tried-and-true but still good salmon rillettes and watermelon gazpacho with tequila from Shadow Hills Country Club. Never thought I’d say I like country club food, but there you are. Whoa, and the wild boar agrodolce over polenta at Excelsior? A wonderful sweet and sour turn of that pork classic. 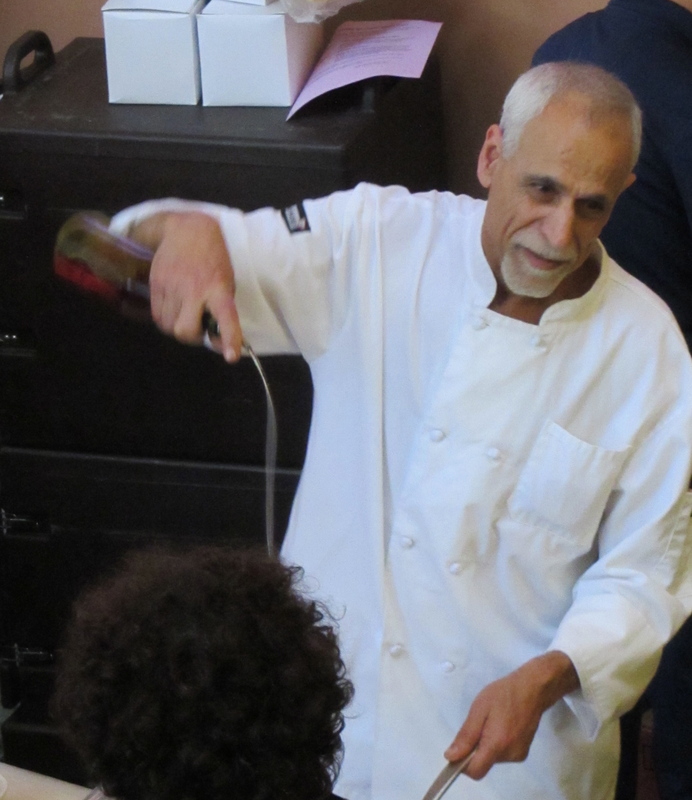 Has Excelsior hired chef extraordinaire and our best local magician with sweets Shane Tracey, formerly Executive Chef Owner of Nib? It took a minute to recognize him, because I was thoroughly puzzling over the trio of desserts at the table. When did Excelsior up its pastry game to this level?, I was thinking. Then I saw Shane and it was clear. 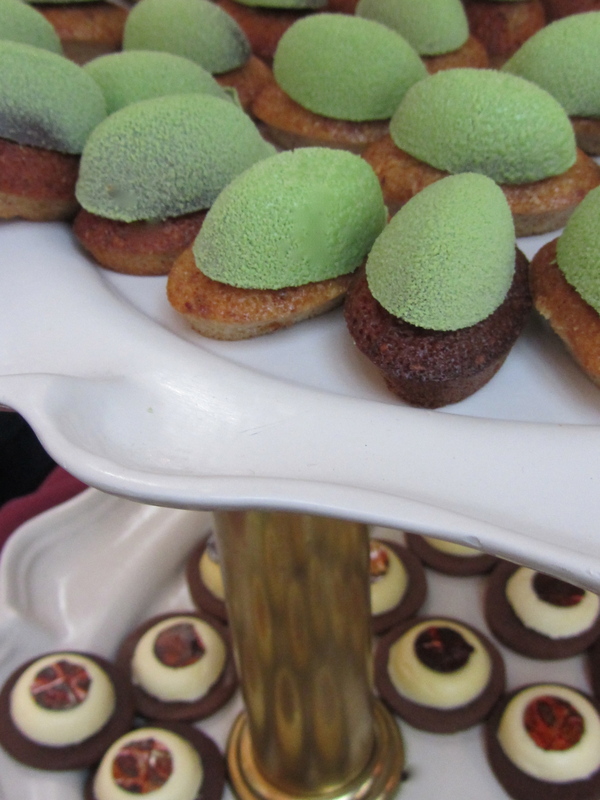 You can see two of the desserts above, a little cocoa bomb clothed in green on a brown butter financier and an interpretation of tiramisu with a pretty little hand-painted chocolate disc. 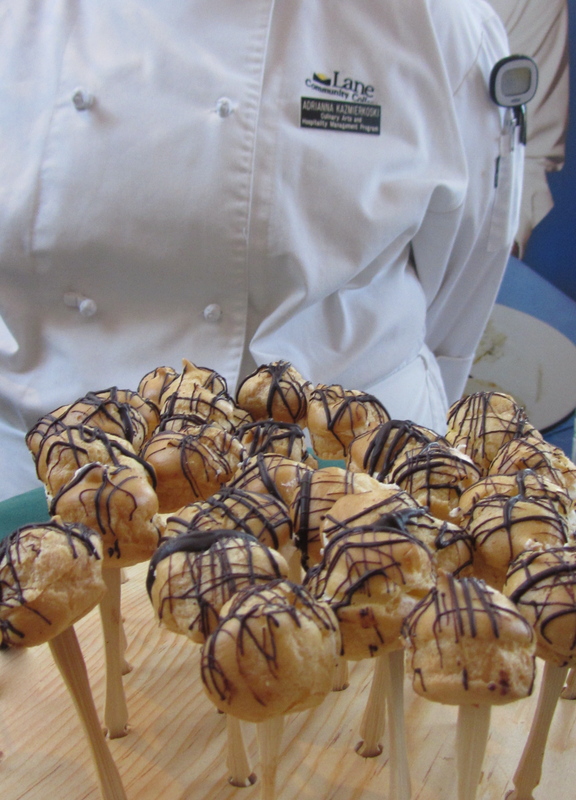 My favorite sweet bite, though, and again a surprise, was the ultra lavender cream puff on a stick made by the students at LCC (first photo). They infused both the pastry cream with lavender and the whipped cream with lavender-powered pear brandy. It came on strong and left creamy. A perfect dessert. My favorite cocktail was the quickie Cocchi Americano-Rye signature cocktail at Rye, hands down. Had I known about the lounge earlier, I would have made off with that punchbowl. I had again a memorable glass of Roussanne at J. Scott, which quenched my white wine trending thirst, and a really good dry rosé at King Estate, which I am told is one of several, and which I do not know from the others. Oops. 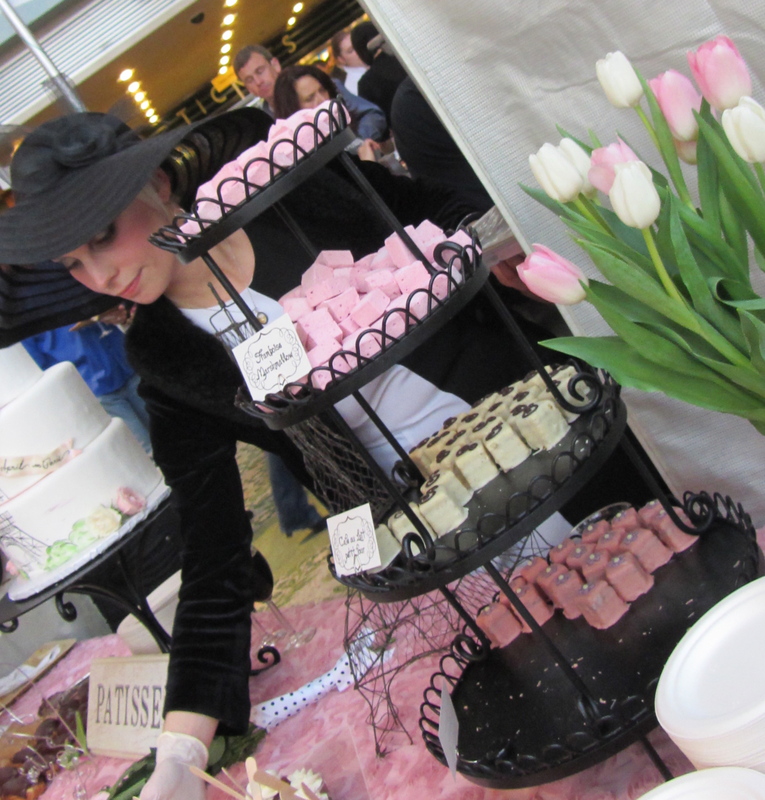 I agree with the awards committee that Sweet Life had the best presentation, what with its pretty server in Victorian mourning and the tulip-themed sweets all over the Parisian pink Eiffel-towered table. But I would create my own award for the unintentionally coolest in a weird way bite. That would go to Mazzi’s, who served that mystery of mysteries, alive in 2013 only in Eugene — Steak Diane. The steak was so-so and I’m still trying to figure out why an Italian-American joint would serve it at the tasting, but I liked the sauce and the hundreds of little cups over the Mazzi napkins. Something very mod about it, both in form and function. All in all, a good night and lots of fun. Hope it went well, Food for Lane County! You can see a full photo spread of the night’s photos on my Facebook page. I’m pleased to announce the University of Oregon Center for the Study of Women in Society Food in the Field Research Interest Group Visiting Scholar Lecture for AY 13-14. 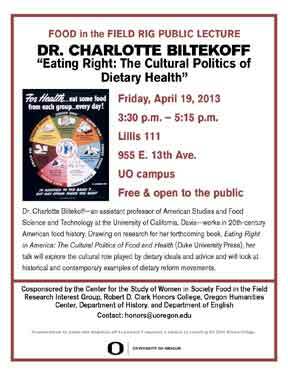 Dr. Charlotte Biltekoff, Assistant Professor, American Studies/Food Science and Technology at the University of California at Davis, will be speaking on her forthcoming book, Eating Right in America: The Cultural Politics of Dietary Health, on Friday, April 19, 2013 at 3:30 p.m. in Lillis 111. The talk is free and open to all. Yes, parking is difficult near campus; sorry. Dr. Biltekoff’s book is an important contribution to the field; it analyzes the relationship between moral campaigns and food reform movements in American history. Trust me, this is a fascinating topic. Our breakfast cereal industry was founded on a thoroughly American mix of sexual abstinence, fresh air exercise, and commercial crop potential. And that’s just the beginning. And you may be interested to note that Dr. Biltekoff has served in leadership roles in the burgeoning Robert Mondavi Institute for Wine and Food Science at UC-Davis and the Association for the Study of Food and Society, so she’s a great person to chat with about the future of the field as well as the past. We’ll be hearing more about the upcoming talk on Food for Thought on KLCC, Sunday at noon (PST) on 89.7FM in Eugene, or its sister stations all across Oregon, or live on the web. And if that’s not enough to grab your attention, how about our other guest on this week’s show, farmer Paul Atkinson of Laughing Stock farm? YES! Renowned on the West Coast for his pork (which is simply the best pork I’ve ever eaten, and everyone from Chez Panisse diners to The Atlantic’s Senior Editor Corby Kummer agrees) and famous on this blog for his work with friend Del Del Guercio making goat milk cheese and cured meats on the farm for local consumption (as in so-local-it-fell-into-my-mouth local), Farmer Paul will be in our studio! He’ll chat about the other white meat, dairy farming, duck eggs, heritage squash, land use, curing caves, WWOOFing, and/or who knows what else with Ryan and me at noon. This is a show that should not be missed.